Every bride out there longs to have their dream wedding come true. While dreams often do become a reality, they are never quite perfect. In some cases they even become nightmares and a day that should be full of joy and happiness turns into a day of dread and despair. Unforeseen circumstances can damage any wedding and force plans to change at any minute. 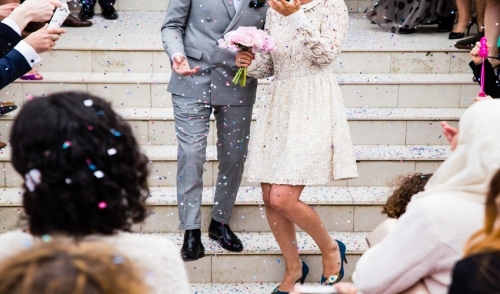 Follow this article to avoid a wedding nightmare and an extremely stressful situation. In most cases, wedding nightmares occur due to a lack of preparation. The first tip to avoid a wedding catastrophe is to always be prepared for bad weather, especially if your event is taking place outside in any capacity. Most wedding nightmares start with bad weather for an outdoor wedding. The best way to do protect yourself against bad weather is to rent a tent. Renting a tent is way easier than reserving an entirely new venue, and they can be assembled in just a few hours. Another benefit to renting a tent is that they come with multiple attachments. What if the bad weather isn’t rain, but the sun and outdoors is just physically too hot? Heat waves can happen at anytime during the warmer months and can put your guest at risk of heat exhaustion or dehydration. Along with renting a tent, you can also add attachments such as sidewalls, industrial fans, and portable AC units to keep guests cool and dry during the ceremonies. For any outdoor event, a tent is completely necessary to protect yourself, your guests, and the event itself. Tents come in multiple sizes and styles so feel free to consult with your rental dealer about which options best fit your wedding. Wedding nightmares are completely avoidable with the right planning and groundwork. Put a deposit down on a tent early to reserve yours as soon as possible. Tents are very popular items and the best ones will go fast. Don’t forget to work with your venue to make sure it can accommodate the tent you have in mind and work out options with your caterer. While planning your wedding, its important to step away from the dream and all of the influences from friends and social media sites like Pinterest to think about your wedding more holistically. Instead of only focusing on what needs to be perfect, consider the potential problems that may arise out of your quest to have the idea wedding. Plan, prepare, and rent essential items like tents to set yourself up to have the best wedding possible, regardless of the cards that may be dealt on the day of. Contact your local rental dealer and discover new ways to avoid wedding nightmares today.